Another player looks to inch his way up the TOC standings. Can he do it? It’s going to be tough with these scores, and a nondescript category. Once again, a quick look at the optimal wagers. 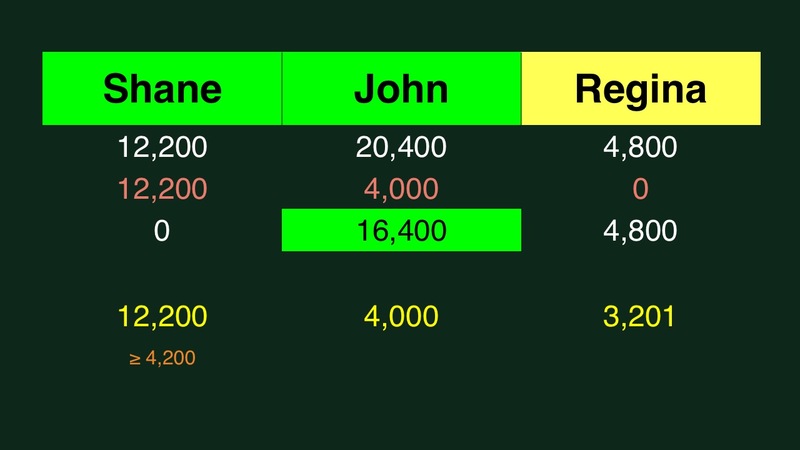 John should wager 4,000 to cover Shane. Shane needs to get it right, so he might as well wager everything. Regina is out of contention for the victory. If Shane wagers the bare minimum – 4,200 – he’ll be left with 8,000. To beat that outright, therefore, Regina should wager 3,201. What a dumb, dumb clue. To paraphrase the catchphrase from 21 Jump Street, we’re too smart for this shift. 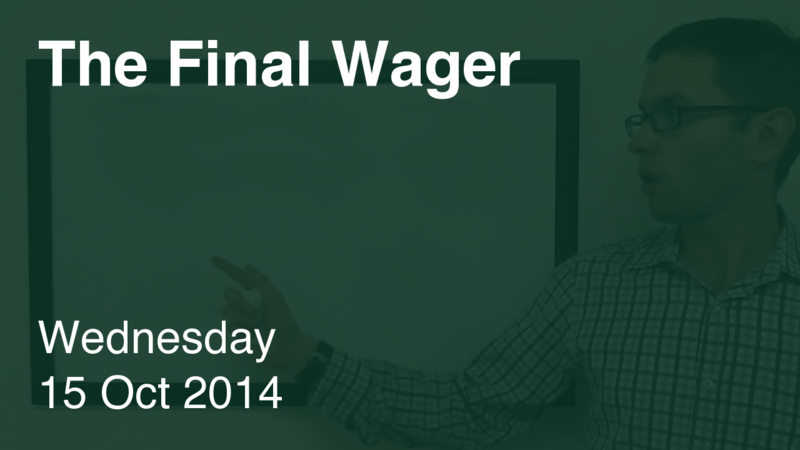 Now, let the “wager to tie” debate begin once again. Your remarks on how terrible the Final Jeopardy clue is are, if anything, an underestimate. The backslash is not used in computer commands for either Unix or DOS/Windows. Where it IS found is in directory paths. But wait, there’s more awful news. The backslash is only used in DOS/Windows directory paths. Both Unix (and its children like Linux) and Internet URLs (i.e. “http://thefinalwager.com”) use a forward slash, or just a just plain slash. And people who don’t know what they are talking about but want to pretend they have tech cred will frequently incorrectly call the separator character in URLs a backslash. It isn’t. A forward slash is what you find in the “%” character. The top is on the right and the bottom is on the left. The slash shares the key you use with the “?” or question mark.. With the backslash it is the opposite, namely the top is on the left and the bottom is on the right. It shares the key you use with the “|” or vertical bar. This clue is just so wrong on so many levels.